Today's 10am Mass was said by Clesio Mendes with Gerry Prindiville and a young seminarian assisting. The Neocats behaved as though it was just another Sunday: no reference to the walkout last week; no reference to the community's letter to Prindiville sent during the week; certainly no apology for denying us the Eucharist; nothing. Copies of the letter were provided next to the church bulletin for people to read for themselves, and at the end of Mass, after the celebrants had left the altar, one of the letter's signatories read it out from the lecturn while the seminarians scurried about clearing the altar. The Neocats in the congregation left rapidly (as is their habit), and Prindiville led his cohort from the sacristy before the reading was complete to cries of "shame!" So, Gerry Prindiville, nothing has changed. There is no engagement - only enragement. As usual, whenever we as a community or as individuals try to engage you or your fellow priests in dialogue, our efforts are met with stony refusals to engage. Rather, you choose to assert your authority as priest as if that should be the end of it. You refuse to participate in community with us. All of you, your fellow priests and the members of the congregation who identify as part of the Neocatechumenal Way, fail to assist with our weekly meals for the poor, in our Sharing the Journey discussions, and in the simple acts of morning tea and friendship after Mass. This is despite numerous invitations issued to all of you over the past years. It is, to say the least, unhelpful that you should lead "your" people out of the Church immediately after the conclusion of Mass not just today but on every Sunday, ignoring us as you do so. Seminarian giving Neocat sign of reconciliation as the clergy hastily leave. A group of St Vincent's Redfern parishioners has called for reconciliation with the parish priest, Fr Gerry Prindiville, after the NSW Ecclesiastical Regional Tribunal upheld a defamation complaint by parishioner Clare Maguire against a former assistant priest. The Sydney Morning Herald reports that Clare Maguire claimed her right to a good reputation had been violated by Fr Dennis Sudla, a Neo-Catechumenal priest. The decision of the Ecclesiastical Regional Tribunal, a key church judicial body, was this week posted on the parish's community blog, The Church Mouse, and confirmed by the offended parishioner. Ms Maguire declined to elaborate on the priest's behaviour but said the matter came to a head over an exchange in the presence of witnesses during Mass, while she was stepping forward to put flowers on the altar to commemorate Hiroshima Day. "I'm very satisfied. But were this a civil case, there would have been a very large financial compensation for the content of his words," she told the Herald. Ms Maguire said the judgement had yet to be executed but in part required a financial sum to be paid towards the costs of Sharing of the Meal, which is the parish's twice-weekly provision of meals and hospitality for people in Redfern. But despite the potentially explosive finding, Church Mouse yesterday published an open letter from Ms Maguire and three other parishioners calling for reconciliation with the parish priest. The letter is in response to Fr Prindiville's own letter read to the parish last Sunday in which he also appealed for reconciliation in the parish. The four parishioners said that "it was good to see your letter acknowledge that OUR Parish 'has particular characteristics, with its indigenous population and the significant heritage of [former parish priest, the late] Fr Ted Kennedy's work'". "We would like to acknowledge your request for cooperation and harmony, and your expression of an earnest desire to fulfil your role in the parish as you see fit," the parishioners wrote. However, the parishioners remained critical saying that "we are painfully aware that non-Aboriginal people are treated differently" and expressing concern over "the ongoing disregard for, or unawareness of, Aboriginal culture and spirituality". The letter also criticised Fr Prindiville for "walking out" of Mass last Sunday over the words of an offertory song he considered to be "political." The letter concluded that "we believe that the Gospel of Jesus requires that both priest and community approach each other in a spirit of honesty and forgiveness for the process of reconciliation to begin." RELATIONS between conservative clergy and parishioners in the troubled St Vincent's parish in Redfern have taken another dramatic twist, with a church tribunal finding that an assistant priest defamed a parishioner. In an unusual case, the Ecclesiastical Regional Tribunal for NSW, a key church judicial body, has upheld a complaint against a former assistant priest, Dennis Sudla. Clare Maguire claimed her right to a good reputation had been violated by Father Sudla, a neocatechumenal priest. The tribunal's finding was this week posted on the parish's community blog, The Church Mouse, and confirmed by the offended parishioner. Ms Maguire declined to elaborate on the priest's behaviour but told the Herald the matter came to a head over an exchange in the presence of witnesses during Mass, while she was stepping forward to put flowers on the altar to commemorate Hiroshima Day. Before lodging her complaint, Ms Maguire said she had approached nine different levels of the church hierarchy and each time was redirected to Cardinal George Pell. "I'm very satisfied. But were this a civil case, there would have been a very large financial compensation for the content of his words," she said. Yesterday, in a separate matter, parishioners issued an open letter to Father Gerry Prindiville, accusing him of walking out of Mass last Sunday because he regarded the words of the Offertory song to be political. Parishioners said the parish clergy had also ignored and ridiculed lawful parish customs and claimed it had turned away some Aborigines from the altar. They also defended their right to bring issues such as the plight of Aborigines and asylum seekers to the liturgy. Last week Father Prindiville appealed to parishioners to co-operate with him so he could carry out his parish role. Thank you for your letter of August 13, 2006. It was good to see your letter acknowledge that OUR Parish "has particular characteristics, with its indigenous population and the significant heritage of Fr. Ted Kennedy's work". We note with interest and pleasure that this is the first time you have made such an acknowledgement. We would like to acknowledge your request for cooperation and harmony, and your expression of an earnest desire to fulfil your role in the parish as you see fit. At the same time we note that since your appointment over three years ago, the Community has remained hopeful of witnessing your "great love and respect for our indigenous brothers and sisters". We draw your attention to the large number of written and verbal complaints that have been made to you expressing concern over the ongoing disregard for, or unawareness of, Aboriginal culture and spirituality. We are deeply concerned that you and your assistant priests have seen fit to ignore and ridicule lawful customs of our parish. How many Aboriginal funerals have there been here during the last three years? How often have we seen Aboriginal members of this Community publicly challenged about their state of sacramental preparedness at the very point of receiving the Eucharist, and turned away from the altar, confused and humiliated? We are painfully aware that non-Aboriginal people are treated differently. To refuse Holy Communion to any person not prohibited by the Church from receiving the Eucharist is a violation of the norms of the Church you say in your letter “must be respected by all”. For over thirty-five years this Community has attempted to live out the Gospel imperative of giving welcome to the marginalised regardless of colour or creed. This inevitably translates into a disruptive and demanding invitation to accept individuals who have been born into structural violence. We have chosen to be confronted by the presence of God "in the least", with whom Jesus so clearly identified, both in his earthly life and as the Risen Lord of the Gospels. After all, the final revelation of Jesus is not about knowing but about loving. Your acknowledgement of the importance of social and justice aspects of Church life begs the question: when and where do you find the "time and place" for them? At St Vincent’s we have a long tradition of breaking open the word of Scripture so that it may speak to us of today. The image evokes the Eucharist itself. To us, the Incarnation means that we discover the relevance of the Word to real people in real life. This brings real issues - like the often hidden sufferings of Aboriginal people or the desperate plight of asylum seekers – to our liturgy. You may consider these things as "politics" but to us they are the very cry of the God seeking Compassion and Justice in this world. We bring issues into our liturgy because we believe that it is only in prayer that we can adequately name them. Fr Gerry, last Sunday during the celebration of the 10 am Mass you left the altar at the Offertory, for your stated reason that you regarded the words of the Offertory Song as “political”. Your action of walking out and thereby terminating the celebration of Mass deprived us of our Sunday Eucharistic celebration and of our bread of life for the week’s journey. This is a violation of the community and of your own priesthood of the Jesus who came to serve. It was a violation of “the norms and traditions of the Church” that you say in your letter “must be respected by all”. The Community remains deeply grieved that as the parish priest charged with the pastoral care of our parish you would act in a way so violative of your duties. We appeal to you to resume your place as the celebrant in our Community. We believe that the Gospel of Jesus requires that both priest and community approach each other in a spirit of honesty and forgiveness for the process of reconciliation to begin. 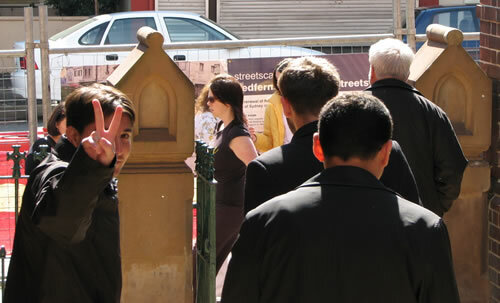 Over the last 30 months or so, members of the St Vincent's community, as a group and individually, have been trying to establish a dialogue with the hierarchy of the Catholic Church regarding the untenable appointment of proponents of the Neocatechumenal Way to the Redfern parish, and their unacceptable behaviour. Letters were written; meetings were held. Inevitably, it seemed, each attempt met with rejection – a rebuke for being so impertinent as to criticise the clergy, a “misunderstanding” or outright denial of the issues raised, a “go and talk to the Cardinal” fob-off, or most often, no response at all. With each rejection, the point of contact moved up and about the hierarchy, starting, of course with the parish priest Fr Gerry Prindiville, followed by the likes of Mgr. 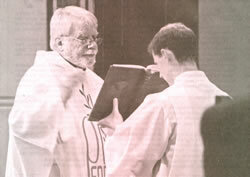 Vince Redden - then Archdiocesan Vicar for Clergy, a Canon lawyer, Mgr. Brian Rayner - then Archdiocesan Vicar-General/Chancellor, Cardinal Pell Archbishop of the Sydney Diocese, Archbishop Hickey of the Perth Archdiocese, the local Church Professional Standards Committee, the National Committee for Professional Standards, and last but not least, Archbishop Carroll – then President of the Australian Bishops' Conference. All these avenues were exhausted well over a year ago. Because of some specific behaviour over a period of time by the assistant priest Fr Dennis Sudla towards one of the members of the community, Clare Maguire, canonical advice was sought from Dr Rodger Austin as to how this matter might be addressed. As Sudla was unwilling to attempt to resolve the matter through a process of mutual consultation, Clare Maguire lodged a petition before the Ecclesiastical Regional Tribunal for New South Wales and the Australian Capital Territory, claiming that her right to the good reputation which she enjoys had been violated by Sudla. The Tribunal is a Church court which is essentially about rendering justice while applying the Church's Canon Law. In other words, the Tribunal is a judicial body and a pastoral ministry of the Church, which deals with issues involving injustices and any cases that might need the interpretation of the Church's own Law. Most of its business is in marriage annulments; defamation cases are quite unusual. The Regional Tribunal has issued a definitive judgement in response to Clare's petition in which the Judge determined that Fr Sudla had defamed her. Sudla did not exercise his right to appeal and the case is now completed. In fact, the former assistant PP has not been sighted in Redfern since shortly after the petition was lodged. He was last mentioned in an October 2005 church bulletin as being “in the Philippines doing missionary work and … near his family who need his help”. The final step in the process is the execution of the judgement which is expected to occur shortly. Following Paula McLeod’s article last week, Rise Up for a Just Church, several comments were made to me which have been encapsulated in this week’s letter, Some help please! from Fr Sanchez, of Brisbane: basically that people would like to write – but to whom and what needs to be said? In the specific case of Redfern, Cardinal George Pell, and the parish priest, Fr Gerard Prindiville, would head the list. Other possibilities include Archbishop Philip Wilson (Adelaide), as President of the Australian Catholic Bishops’ Conference, and Archbishop Barry Hickey (Perth), the chair of the new Bishops’ Commission for Relations with Aborigines and Torres Strait Islanders. If you want to go further, other Bishops could include Christopher Toohey (Justice and Service), Eugene Hurley (Pastoral Life) and Michael Malone (Church Ministry). And, of course, there is always your local Bishop. To offer support to the local Aboriginal community, the National Aboriginal and Torres Strait Catholic Council (NATSICC) might be able to offer some assistance or provide the names of local contacts. An excellent source for information about the Catholic Church in Australia normally is the Australian Catholic Bishops’ Conference site within the Church portal. While it is not up-to-date with the new structure of the ACBC, unfortunately, it will give you easy access to emails and postal addresses for all the Bishops. As to what to say, Paula has suggested that in relation to Redfern, essentially the point to make to our Bishops is that all of the communities within a diocese "have a place at the table". All must be heard from and accounted for, and each one must show consideration for the rest and for the good of the entire church. She says that Redfern is not just an administrative unit of a larger entity. It is a gathering of Christians in which the Spirit dwells. No parish should be more privileged than another. No parish is second-rate compared to others and should not be treated as such. She says that this website also has links to sample letters to bishops on a range of topics. It is important when writing such letters that you make your point clearly, briefly and without allowing the emotion that has generated the letter-writing to dominate. You do not want to give the impression of being impolite or unreasoned. It is also important that you express what you want to say in your own words. While this can be more difficult for some people, it is worth the effort as your opinion comes across much more genuinely to the recipient of the communication. If you need further help, then your local social justice group / diocesan commission might be useful. It is important that we communicate with our Bishops. The 10am Mass on Sunday at St Vincent’s was stacked with many more Neocats than usual, including a significant proportion of first-timers. They were almost strategically distributed about the church, surrounding the community, to hear Prindiville read this letter to the congregation before Mass on Sunday. It was also published in the weekend’s parish bulletin. Our parish of St. Vincent has recently been in the news. For this reason Fr Clesio and I wish to appeal to you for cooperation. More than three eventful years ago I was appointed as Parish Priest by the Cardinal. I accepted this mission with joy and am still happy to be here to serve. The parish has particular characteristics, with its indigenous population and the significant heritage of Fr Ted Kennedy's work. We did not come with any preconceived idea or plan. We have great love and respect for our indigenous brothers and sisters, and for all to whom the Lord invites us to announce the Good News of Jesus Christ. This parish has a history of involvement in social and justice issues for which there is a time and a place. We acknowledge the importance of this aspect of Church life: we have both lived and worked among the poor and oppressed - Clesio in Brazil and I among displaced Haitians in the Turks and Caicos Islands. We can have different ideas or opinions on many aspects of the life of the Church and of society, but the Liturgy is where we can experience communion, accepting also that there are different roles in the Body of Christ. The celebration of the Mass is not the place for making political statements or points, but rather the place where the Lord passes among us. This requires that all accept the norms and traditions of the Church in relation to the Liturgy. We therefore insist that during the Mass the introductions be brief and related to the Scripture proclaimed. This is not the place for criticism of the Church, the Bishops or clergy. Likewise the Prayers of the Faithful should be brief and genuine prayers. It is not appropriate to give long explanations, or make critical statements. We are simply asking the Lord, who knows our problems and needs, for his help. All are welcome to participate in the celebration of the Eucharist, but the norms and traditions of the Church must be respected by all. It is our duty when we preside at the celebrations to ensure that this happens. There is no place for interventions or interruptions without the knowledge and consent of the presiding priest at any time until after the final Blessing. We ask that all respect our wishes, in order that together we may journey towards the heavenly banquet which will be the fulfilment of all our desires. The Church Mouse wonders whose pusillanimous performance piece this actually is. It has little in common with the Prindivillean utterings to which we have become accustomed. In the true spirit of journeying together towards the heavenly banquet, the community’s commentary on the readings and Prayers of the Faithful were apparently recorded by the Neocats, no doubt to be carefully scrutinized for heresies that might provide fuel for a little burning at the stake. Who really gives a fig about Redfern? If it were East Timor or West Papua the letters would be flying in all directions! My mail this week revealed the usual clutch of bills and brochures, but the letter that caught my attention was an envelope with “Rise Up for a Just Church” emblazoned across the front. The contents revealed the latest letter from the American lay activist movement Call to Action, celebrating its 30th year in 2006. Interesting I thought: 30 years of advocacy for the accountability of bishops. Thirty years of asking the hard questions about the place of the laity in Church governance, the future of the priesthood and the thorny issues of sexual orientation, race and the role of women. Thirty years of working for justice and dignity within our Church. But who really gives a fig about all these issues? Call to Action obviously does, but what about Australian Catholics? For most, all this is really a matter of Ho hum, yawn. Let me know when it’s all fixed and I might prise myself out of my comfy parish pew to get involved. And maybe they are right; our parishes today are hardly hotbeds of discontent. Parish life runs smoothly as long as you have enough people to finance the pastoral needs and the committees are full of willing workers to make it all happen. Church law defines the jurisdictional and public ministries of priests and those employed by the Church, and is a strong deterrent to public utterances of discontent, which can be very risky if you want to keep your job. As a result injustice within the Church is a very controversial topic for public parish dialogue and is generally saved for conversations among trusted friends. Should Australian Catholics publicly call into question unjust actions within our Church? Our Catholic formation has certainly sensitised us to the consequences of silence and inaction on justice issues. What becomes of parishes like Redfern if we remain silent? Are they are left to fight the battle on their own? Do we stand by and watch from our parishes thinking: Thank goodness we don’t have that problem here. Let’s get on with organising our next function. During this week many of us will gather with other parishioners or colleagues at meetings and slip an intention for Redfern into the essential opening prayer. This will probably be followed by the essential exclamations about how dreadful it all is. What would you do if Redfern were your parish? In Sydney on Pentecost Sunday, I sat beside long-serving parishioners from Redfern and listened to them speak with pain and passion about their community. One could only stand in solidarity with the people of Redfern after hearing their stories of marginalisation. The article, John Paul’s words a weapon in parish war by Peter Lalor (Weekend Australian, August 5-6, 2006), is surely our very public invitation to express our solidarity. Maybe this time our distractions, parish commitments and fears will not excuse us from taking the risk. Think about it. If this injustice were happening in, for example, East Timor or Western Papua, our parish social justice groups would be penning letters in many directions to all concerned. So why not apply the principles of Catholic social teaching to Redfern and see, judge and act accordingly? Write to your Bishops, even the Cardinal, but more importantly let the struggling people of Redfern know that you stand in solidarity with them. Catholics belong to a very powerful Church whose public voice demands, in the name of Christ, integrity and justice for all creation. Catholics also belong to a Church that sometimes fails to critically examine its own actions against the tenets of the gospel it proclaims. So this time – Give a fig! and rise up for a just Church. Paula McLeod is committed to a just Church. She is interested in the influence of parallel organisations (e.g. Call to Action) in shaping our vision of Church. Paula is currently completing an M.A. (Theology) with a particular focus on women’s formation and conversion in the Catholic Church. A little sympathy for Prindiville? The following curious article appeared in The Australian today. It should be noted that the good Cardinal was not criticised so much for his opinions on how to help the Aboriginal community, as for the implication by association in those words that the St. Vincent's community is involved in such activities. It should also be noted that yesterday was Hiroshima Sunday, so the liturgy included a number of uncomfortable (leftwing?) reminders of the past - such as the sad fact that the atomic weapons dropped on Japan were blessed by Catholic priests before they were deployed, and that the small Catholic population of that country was decimated in the devestation caused by those bombs. CARDINAL George Pell was repeatedly criticised during mass yesterday in Redfern for saying that handing out syringes and condoms was not the way to help the Aboriginal community. The Archbishop of Sydney made the comments to The Weekend Australian in support of the parish's conservative clergy, now at loggerheads with their turbulent inner-city congregation with its strong liberal Catholic tradition. Aboriginal deacon Frank Cain received a standing ovation yesterday when he told the congregation he was proud to be involved in the painting of a mural a week ago, on one of the internal walls of St Vincent's, which marked an escalation in the conflict. "This mural is not a sacrilege in any way, shape or form," he said. "We are not social workers, welfare workers, and we are certainly not a medical team handing out contraceptives and syringes, as Cardinal Pell bluntly states in The Australian. Neither are we extremists causing trouble, as Cardinal Pell again states in The Australian . "We ask that the church respect the mural for its theological and spiritual symbolism, cultural nature and reconciliation themes." The parish acquired a strong social justice agenda under the 30-year leadership of Father Ted Kennedy, who died last year. Since then, there has been a growing divide between the clergy and parishioners, including the mentally ill, alcoholic and Aboriginal. The unauthorised mural, painted without the permission of parish priest Gerry Prindiville, quoted John Paul II: "Your dreaming is your own way to touching the mystery of God's spirit in you and in creation," it reads in part. 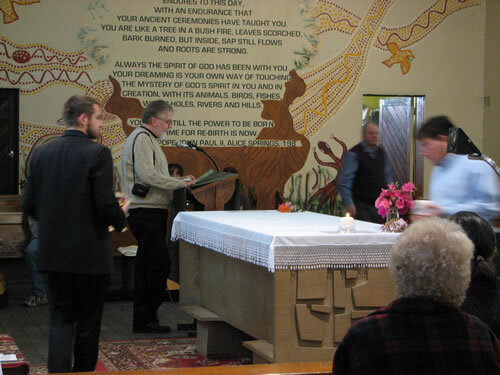 Father Prindiville, criticised for his lack of empathy with the local community and with Aboriginal spirituality, led the mass yesterday morning but was forced to listen while his largely left-wing parishioners repeatedly condemned or questioned the church and its hierarchy. Sister Sheila Quonoey, who led the community commentary for the mass, continued the anti-authoritarian theme when she said: "God calls us beyond the boundaries of our comfort zones whether that space is physical, cultural, religious, racial or our own family. God's word subverts our familiar world." She described the mural as a "wonderful image to give us courage, hope and commitment to true justice for Aboriginal people in this land". A spokeswoman for Cardinal Pell said he was overseas and not available for comment. My name is Frank Cain and I have been a member of this community for around twenty years. I am proud to have played a part in the liturgy of the Message Stick and establishing the Mural at St Vincent’s last Sunday. The Mural is a symbolic artistic gesture of the discernment of God’s beautiful face in creation. It conveys the words of the Vicar of Christ, or Christ’s representative, the late Pope John Paul II, stating that the Aboriginal people make up part of the Church of this country and recognizes their Catholicism as well as their own unique spirituality. These words are the justification for the existence of the Mural. It is not sacrilegious, as claimed by some, in any way, shape or form; neither is it a jape or joke as described in Monday’s Sydney Morning Herald article. Some aspects of how the Mural came to be may be frowned upon by some, but this Church was not broken into by any parishioner as claimed in that article. If some of us were to have broken into the Church as suggested – what a shame that we had to – because once upon a time we could walk freely in and out of this Church – especially on Saturday evenings when we were welcomed at Mass and not questioned if we were Catholic or eligible for Communion. The statement that we, the parishioners of Redfern, “won’t accept any sort of authority” (SMH) is wrong. The fact is that we do accept authority, particularly the authority given by Christ to question when authority fails to respect the truth or the people. And we remember that Christ spoke with authority on a par with the people, and not to them or at them. Salvation is not necessarily obtained through dogmatic rules and regulations. It can be obtained through caring for the sick, serving the poor, the needy, the oppressed, providing a voice for the marginalized, the down and out, the fringe dwellers and the outcasts. And providing basic human care and resources to people in need, as well as empowering and encouraging people to be independent and acknowledging “the human soul” in that respect. In John Paul II’s words “The greatest value to be achieved …. Is respect for the dignity and growth of the human person”. We are in fact liberal minded Catholics with a profound devotion to Christ through his teachings and through the Eucharist. And we ask that the Church recognizes and respects the Mural for its theological and spiritual symbolism, its cultural nature and theme of reconciliation. LAST Saturday night, a group of conservative Spanish missionary priests held their mass in a middle-class Redfern terrace. The Eucharistic loaf was baked according to a strict recipe and the furtive community prayed like early Christians. Nearby, at their empty Catholic church, a confronting mural was drying on the walls. 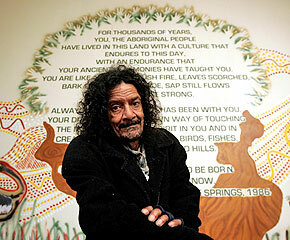 The work featured the words of reconciliation spoken by Pope John Paul II to the Aboriginal people in 1986. For months, a group of 20 Aborigines and Christian activists had planned the painting in secret. They did not tell the new parish priest, Father Gerry Prindiville. On Saturday afternoon, a small group moved in with ladders, stencils and paints. Somebody had the key to the adjoining medical centre, which allowed access to the St Vincent de Paul property. Somebody else had left a door open so the guerilla artists could gain access. Garry Griffiths, a Redfern resident for the past 48 years and one of hundreds of Aborigines who had slept for years in the presbytery with the former priest, Father Ted Kennedy, was one of the artists. A member of the Kamilaroi mob, he painted his totems: an emu and a goanna. He helped put the tree around the former pope's words. "We had nowhere to plant one so we painted one," Griffiths explained. On Sunday, scores of locals turned up for the special ceremony to mark Pope John Paul II's visit 20 years earlier. "Mate, I was so proud, it was the best turn-up we've had here for a long time," Griffiths said. "Our people's faces lit up when they saw it." But Father Prindiville's face fell noticeably. It was the latest act of rebellion in Redfern's religious war. On the outside wall of the church somebody has scrawled these words: "Crucified on every city sidewalk, the Aboriginal Christ should be free in his own church, among his own people in Redfern." The message is notice of a conflict that is getting more heated by the minute. On one side of the battle are the Kooris and community workers; on the other the Cardinal George Pell and the conservative evangelical priests called the Neo-catechumenal Way. The Way is a Spanish missionary movement set up in the 1970s by an evangelical painter who was a student of Picasso. It has hundreds of thousands of recruits around the world, two seminaries in Australia and was only recently recognised by the Vatican. The Neo-catechumenal missionaries were sent into the parish in 2003 by Cardinal George Pell after the retirement of the beloved Father Kennedy a year earlier. The Way does not hold with social work, is not fond of open masses and has turned its back on decades of liberal Catholicism practised in Redfern. Redfern is a unique parish and the church, under guidance of Father Kennedy, established a strong social presence and was associated with the medical centre, housing initiatives and other welfare works. Everybody was welcome at mass, including drunks, the mentally ill and those whose need for a cigarette out the back meant they could never sit still long. Since Kennedy's retirement - he died in 2005 - things have grown progressively less tolerant and occasionally ugly. Cardinal Pell calls it "painful" and blames "extremists" in the community. There are allegations from both sides. The old Redfern mob reckon a new priest threw the Aboriginal cross across the floor and smashed its stand. People have been manhandled, mass has been interrupted and Aboriginal services dishonoured. Father Prindiville is considering removing the new mural. "I don't know whether I will leave it or not," he said. Aboriginal deacon Frank Cain, who helped celebrate Sunday's service, said the Way had alienated his people and the wider parish. 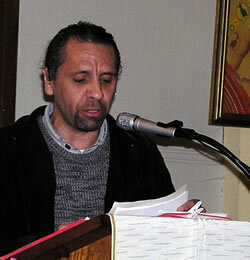 "These Neo-catechumenals have their place in the world, but Redfern is not it," he said. "We believe in a Christ that walked with the people and not on them or above them." Cardinal Pell says most of the people causing trouble are not locals, but agrees that he wants the church in Redfern to move away from social work and concentrate on souls. "I believe as a serious Catholic that the best thing we can offer to people who are suffering, or in some cases degraded, is religion," Cardinal Pell said. "There's no long-term help for anyone in Redfern simply by handing out condoms or syringes or a few bob to clean the church, that's paternalistic." Yesterday morning at the back of St Vincents church, Griffiths's asthmatic lungs fought vainly to get a breath as he huddled over a cup of hot tea, his wet hair dripping. He and 20-odd other locals had sought shelter from the rain in a soup kitchen run by a group of social workers after Friday mass. Father Prindiville and a Brazilian assistant, Father Clesio Mendes, had just finished the ceremony and rushed out past the cold and hungry crowd. "He doesn't want to know about us," Griffiths says. "They don't really want us here." The social workers say the priests won't help carry in the food. At one stage the archdiocese even cut off funding for the soup kitchen, but wide protests saw it re-established. The Way priests also took the Saturday night mass service away. Cardinal Pell says it was to avoid troubles at the service, but it is standard practice for the Spanish group and one the Vatican has warned them about, instructing members to attend public Sunday service at least once a week. The Spanish movement refused permission for outside priests to say a mass at the church on Saturdays, forcing the locals into the nearby medical centre. Earlier, the priests had removed a portrait of Aboriginal welfare worker Mum Shirl from a wall in the church, but the locals replaced it, Father Prindiville took it down again, but it went back up and has stayed ever since. Cardinal Pell says he is willing to go to Redfern to sort out the problem, but months of negotiations have gotten nowhere. "The parish clergy continue to have my full support," he said. "They have been subject to regular abuse, harassment and provocation, often during the mass itself." Members of the local community defend it, saying that they speak up in church because it is the only time anybody is listening. The following letter was sent to George Pell back in May. There has been no reply - not even an acknowledgement of receipt. This is hardly surprising, as many previous communications have met the same fate, or at best elicited a perfunctory response that made no attempt to address the issues raised. The community's attempts at dialogue with the hierarchy have failed miserably, least of all through want of trying. Rather than explore these serious issues, Pell has chosen to demonise the community - there are numerous cases (press reports and letters) documented on this website. The most recent is a letter signed "George Card. Pell" (see Redfern, by George), that was passed on to the Church Mouse by its concerned recipient. A future article will deal with the misconceptions and misrepresentations of the facts contained in this vexatious letter. For the moment, the Mous. feels that the Card. needs to be taken to task over his reference to the "small rump" of opposition in the parish of Redfern. The community's letter was signed by a "small rump" of about 120 parishioners, Aboriginal and non-Aboriginal, who prefer to be at the arse end of the church if the current hierarchy is representative of its head. We, the community of St Vincent’s Redfern, write to you now in urgent need. It is about three years since you appointed Father Gerry Prindiville and the Neocatechumenal Way to St Vincent’s Redfern. As you no doubt know, the experience has been a very unhappy one for all concerned. It is clear to us that the priests, particularly Father Prindiville, are suffering under the strain. We are also suffering, a fact which is clear to the many Priests of your Archdiocese and Religious Sisters who remain a presence and support in our faith lives. The chasm between the Priests of the Neocatechumenal Way and ourselves, and the Aboriginal people who count St Vincent’s as a sacred place, is large and growing larger. We, all of us, are suffering a terrible burden. There are numerous examples of what we consider, at best, to be inappropriate behaviour. No doubt Father Prindiville has strong criticisms to make of us. These outcomes are somewhat understandable and inevitable when two different, incompatible groups are brought together in tension. It seems that the Neocatechumenal Way cannot live their faith in a way which embraces us and that we cannot live our faith in a way in which embraces them. They would seem to be unable and unwilling to try to understand the faith of the late Father Ted Kennedy who as recently as last Sunday, on the occasion of the anniversary of his death, was described by Bishop Cremin as a priest who loved the Church notwithstanding his many criticisms of it. When Father Ted Kennedy resigned you said, in the presence of Ted, Danny Gilbert and the late and much loved Sister Maureen Flood, that you would continue his legacy at Redfern. After several years and two failed appointments, that has not happened. We are a Catholic community whose faith has been nourished and developed by the practice and faith of Father Ted Kennedy. We wish to continue to develop that faith in the knowledge that we are supported not only by the Bishops and Priests who regularly offer us support, but by you as well. We would like to enter into dialogue with you about this matter. We are extremely grateful for the kindness of Father John Usher in his discussions with us over the past year. We urgently look to you, our Bishop, for help. Griffo and friends, what a beautiful work of art you have made in St Vincent's ("A break-in immaculately conceived", July 31). What a shame that nowhere in the article was that recognised by Father Prindiville. He was quoted as being more concerned with the congregation's failure to "accept any sort of authority" than with the beauty of the words, art and artists in St Vincent's. Perhaps he should try walking with the people as Christ did (and clearly Father Ted, too) rather than on them. This is a wonderful story, to see that mural turn the words of John Paul II back on the hierarchy of the Australian church. Too long have Cardinal Pell and the hierarchists of the Catholic Church tried to "own" God through rule and ritual. Local churches are just that, a local community celebrating their faith, not a franchise to be dictated to by "head office". There are some things that make me ashamed at having been born a Catholic and Cardinal Pell's attitude to the Aboriginal parishioners in Redfern is one of them. Hats off to the authors of "the great St Vincent's break-in". In the present conservative climate that has done wonders for keeping lapsed Catholics like me away from the fold, it warms the heart to see the true faithful asserting their values as a community. As for Father Prindiville's comment that "I have the support of the Cardinal, so that helps me", I somehow doubt it. I can sympathise with Father Gerry Prindiville. He must feel as though someone had come and pulled the rug out from under his feet. Just like the original owners of the land must have felt when the white men came and took it from them. Sounds like Father Prindiville is just another whitefella telling blackfellas what's best for them. He could have learnt a lot from his predecessor, Ted Kennedy.